“The Oath” refers to a loyalty oath, in which a Trumpian president proposes that each American sign into over the internet. The administration promises no implications to those who do not sign it, but it becomes clear that special privileges will be applied to the signers. This begins to wear on Chris (Ike Barinholtz), a family man and ultra-progressive who preaches against the Oath. As each of his friends and family sign up, he begins to feel more distant from the America he knows. When Thanksgiving comes along, all these new points of view will be tested at a family dinner. 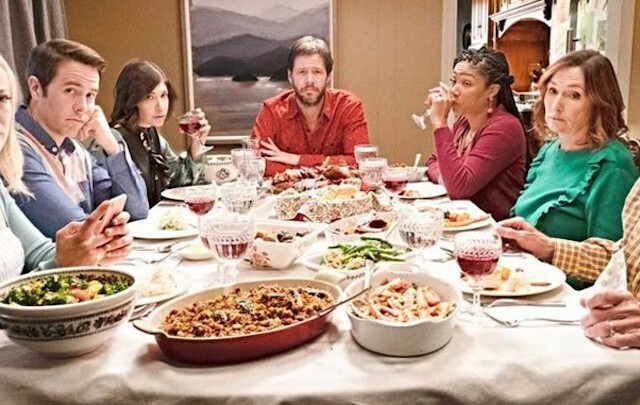 The film, which also features Tiffany Haddish as Chris’s wife and Jon Barinholtz as his brother (also his real-life brother) occurred to Ike B. after the election of 2016. The notion of many 2016 Thanksgivings being ruined by the divisive politics of today had him thinking about the “what ifs?” of extremism in poisoning the country. He created a dystopia in a sense, where loyalty has different definitions to different people. In PART ONE of a Podtalk with Patrick McDonald of HollywoodChicago.com, Ike Barinholtz – the writer, director and lead actor “The Oath” – talks about the process of screenplay to direction, and the particular issues of the film. In PART TWO, Barinholtz talks about different generations of men in “The Oath,” and the Chicago school of entertainment that works in Los Angeles.